Minutes compiled by the 'PRESIDENT' as our Public Relations/Historical Officer is off getting married plus a one month honeymoon. Thus the lack of professional PDF formatting, photos, etc. Congratulations to James and Kim!! 5:00 p.m. the BBQ and beer were called to order. Present included: John, Isabel, James, Kim, Jason, Brandon, Russ, Johnston, and Joe. Guests included: John W., John G. Fleur, Heather, and Gasper. Next up the potluck was well underway with chicken asada burritos and tacos, grilled jalapenos, and all sorts of salsas, dips, and fixings. A bottle of Jameson was opened up on behalf of the chef. Then a large game of tag ensued thanks to little John. Russ is still it. Later this evening an online donation came in for $20. We welcome aboard Steve, MammothMC's newest member. You could be next. A Bald Mountain cabin discussion took place next. A work group is forming due to the neglect this cabin has suffered for far too long. The emailed notice of our monthly meeting usually prompts a lot of miscellaneous correspondence - this month was no different. 1. Public Relation officer's attempt to get the final word on how Honda is allowed to use the Mammoth Track, while the local Joe can't. It's been about 4 months or so, and I've waiting patiently for a response to this. I would still like to know the details on this (questions are in my initial email below). Mammoth M/C is having a meeting this week (thurs), and I would like to offer up some kind of explanation to the attendees regarding this subject - equal & fair access to Mammoth Motocross Track. James – Kazmierski is out of town, so, while many of your questions have been answered many times previously, I’ll provide yet another explanation that specifically addresses the filming permit you reference. 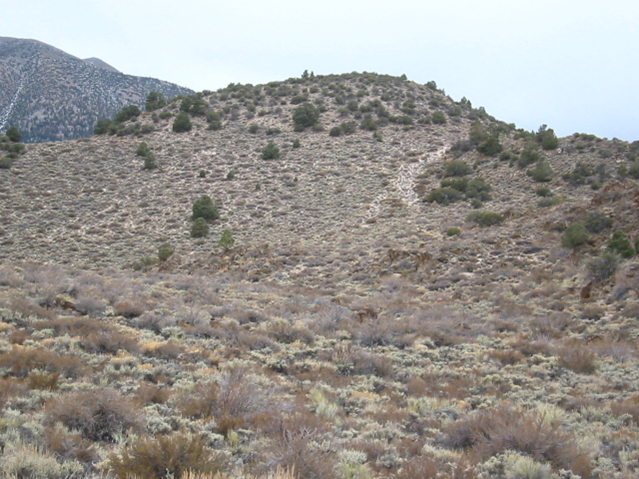 The motocross track south of Mammoth was closed to general riding a number of years ago following a public process and decision made in compliance with the National Environmental Policy Act (NEPA)by the Inyo National Forest. That decision stipulated that access would be restricted via gates, and the Motocross Track would be operated for one event per year under special use authorization, and subject to a number of conditions. The track itself is currently permitted to Mammoth Mountain Ski Area, who have invested considerably in the construction and maintenance of the facilities that support the annual Motocross event. We have stipulated to many interested parties many times that in order for the Forest Service to consider authorizing other uses at this site, an initial requirement would be appropriate coordination with the owner of the permitted improvements, Mammoth Mountain Ski Area (MMSA). To date, none of the advocates of increased riding opportunities for the public have gotten very far regarding agreements on management of the improvements, access, and liability with MMSA. In the Spring of 2012, we were approached by Honda Motor Corporation regarding a proposal to conduct filming under special use authorization at the motocross track. The primary purpose of the proposal was filming, they simply wanted to film riding at the track. Honda was cooperating with MMSA on this, and had planned and obtained agreement from MMSA to conduct this filming in conjunction with MMSA’s authorized preparations for the annual Motocross event. MMSA informed us that Honda had cooperated with them adequately and the two entities were coordinating to conduct this filming. We therefore found that the activities were well within the scope of the prior NEPA decision, and did not have different effects to the environment than the already authorized activities. We therefore issued a temporary special use permit for this filming. Consistent with our regulations for this type of permit, no written decision or case file was prepared for this temporary permit with negligible environmental effects, as this is not required for temporary permits of this sort. I really can’t speak to your speculative statements regarding your motivations, but the above constitute the facts regarding the Honda filming at Motocross track in 2012. Thanks James. Thanks for the quick reply Jon! Personally, I don't ride or race on tracks, and for the most part I stay away from all the unfortunate politics that seem to be associated with "ours." I was simply writing Kazmierski to find out why HONDA had such an easy time accessing our track (for 4 full days) outside of the Mammoth Motocross , while the visitors and tax payers of Mammoth Lakes have not (0 days). Pretty straight forward actually. In regards to the rest of your email... I appreciate the in-depth explanation of "how things came to be for Mammoth Lakes residents, and how they came to be for the HONDA corporation" but it seems as if I had to read between the lines to come up with any sort of answer to my question(s). "To date, none of the advocates of increased riding opportunities for the public have gotten very far regarding agreements on management of the improvements, access, and liability with MMSA. In the Spring of 2012, we were approached by Honda Motor Corporation regarding a proposal to conduct filming under special use authorization at the motocross track. The primary purpose of the proposal was filming, they simply wanted to film riding at the track. Honda was cooperating with MMSA on this, and had planned and obtained agreement from MMSA to conduct this filming in conjunction with MMSA’s authorized preparations for the annual Motocross event. MMSA informed us that Honda had cooperated with them adequately and the two entities were coordinating to conduct this filming." So, in other words... The LARGE population of local riders/supporters who have attended countless meetings, and who've expressed a desire to ride the Mammoth Motocross Track (since 200?) have not worked hard enough or "adequately" enough with the group that is in control of the "Motocross track south of Mammoth" - MMSA. And since the public "hasn't gotten very far..." with this private business (MMSA), they will remain “access-less” via gates. On the other hand, Honda cooperation has a long established relationship (since way back in spring of 2012!) with the permit holder, and has cooperated appropriately (and adequately). Also, Honda only wanted to "simply film riding at the track,” which is different than simply riding the track without cameras - because the cameras validate the riding (confused about that one actually). So in the end, from the generous advise of the permit holder (MMSA), the FS decided to give full access to the Motocross track to Honda for 4 days - via opening "the gates" that are normally closed to everyone. Am I on the right track here (no pun intended)? We therefore found that the activities were well within the scope of the prior NEPA decision, and did not have different effects to the environment than the already authorized activities. We therefore issued a temporary special use permit for this filming. Consistent with our regulations for this type of permit, no written decision or case file was prepared for this temporary permit with negligible environmental effects, as this is not required for temporary permits of this sort. So in other words… The Forest Service decided (mostly from the generous advise of the permit holder) that Honda didn't need to go through any kind of messy public comment or lengthy NEPA process... After all, Honda was on a time crunch and their offroad motorcycles do not have "different effects to the environment" than you expected - or other types of motorcycles for that matter? Or, as you say, "already authorized activities," which I would assume to be motorcycle riding (cant seem to figure this one out either). Since there's no record of any of this, I would also assume that this "decision" took place over the phone, or email, or at a closed session at the Ranger station? too bad, I was actually hoping to see the NEPA paperwork or application, but I guess there isn't any. I must admit, this whole NEPA thing is a little confusing to me - sometimes it's needed, other times it's not...Sometimes is takes very long to accomplish, other times it happens overnight... and most of the time it is claimed to have taken place, but it actually was not. What's most baffling, is when asked to show proof of NEPA paperwork, the Forest Service will even say they "misplaced" it. I really can’t speak to your speculative statements regarding your motivations, but the above constitute the facts regarding the Honda filming at Motocross track in 2012. Thanks James. John, the only motivation is to have a clear view of the "why, what, when and how." I’m sorry if that doesn't sit well with you. After all, the more we know about how things came about, the better informed we are at any possible decisions we might have to make in the future. Right? Speculative? Not necessarily. After all, when it smells like fish and tastes like fish, it usually is fish. Wow, oh no, I thought, "there goes our chances on fixing the Bachar Boulders road closures". Haha, just kidding. Open discussion is important even though it can be unpleasant at times -- understanding can take place. On both sides. 2. Ranger Rick out of Lee Vining was present electronically with a timely email for the club. 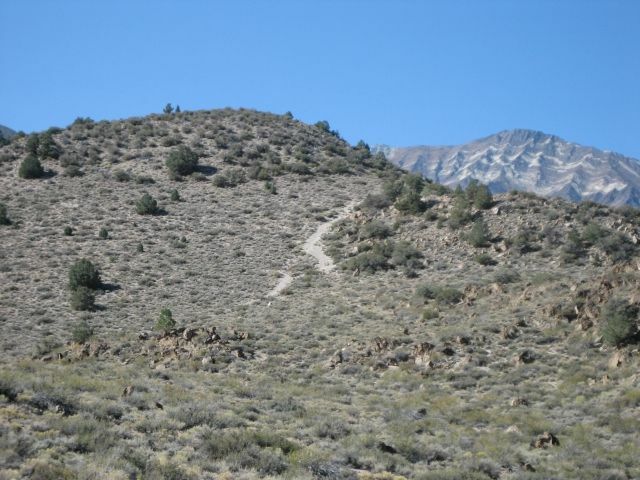 He announced that a newly signed (green carsonite) trail had been marked showing an exciting route from Mammoth Lakes to June Lake. It starts somewhere out behind Shady Rest Park and ends at the June Lake Junction. Although we've pioneered routes the past 20 years connecting the towns, this one will be very important for the visitor to find their way around safely. Just follow the green signs! They say, "Mammoth to June". Rick wanted to mention that local restauranteur and motorcyclist John Mueller helped shape the final product. (side story) Two days later the club went out to examine the route and signage - not bad! Plenty of mishaps and opinions were cataloged but the end result was that in this era of road closing it was refreshing to see someone from the agency (USFS) be proactive and actually help the OHV scene. I witnessed two riders this day crash into unsigned man-made barricades, and one rider superman over a natural barricade. Slow down in the dust! And RIP to the well thought out and managed 'geothermal' trail - I would have thought that instead of destroying miles of fine singletrack the USFS and FOI could give it over to mountain bikers and hikers. So whats the deal? A hill climb was rehabbed out of the Crowley Lake neighborhood to the tune of about $10,000. And it was done well, thousands of bushes transplanted, rockwork, etc. A year later it looks like a tornado came through and whisked all our green sticker monies to the land of OZ. Literally, nothing remains of the road disguising, take a look at the photos for yourself. Before and after. This happened in the past month. BLM doesn't think it is motorcyclists, but the lone motorcycle track going straight up doesn't help. I was asked to go brush it out, and I will -- the president is always happy to lend a hand. BLM ultimately thinks it is backlash to all the roads the USFS has closed, and I'd agree with that conclusion. Most folks don't know the difference between BLM and USFS lands. I do because map reading is a hobby. I also offered up maybe it was hikers and runners, they use that road, my wife told me so. Because if a motorcyclist wanted it open, they might just pick out a few bushes here and there creating a nice singletrack, not a huge truck trail. So if anyone saw a huge road work party going on let us know, just curious. Your secrets are safe with us.